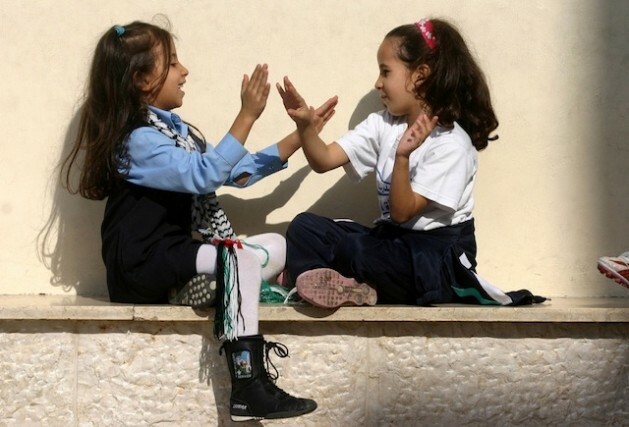 A new crackdown on civil liberties makes the future for girls uncertain in Gaza. Credit: Mohammed Omer/IPS. GAZA CITY, Feb 12 2013 (IPS) - Gaza is becoming increasingly radicalised as Hamas continues its crackdown on civil liberties, press freedom and the rights of women. In the last few weeks a number of journalists have been arrested and accused of being involved in “suspicious activities”, several detainees shot dead by police during arrest attempts, and female students asked to abide by a strict Islamic dress code. Women have borne the brunt of the crackdown. Gaza’s Al Aqsa University has announced that female students will be required to wear full traditional Muslim garb, from head to toe. Some female students have expressed outrage, claiming that the new demands are in violation of their public freedom. They say that already female students are modestly dressed but that some prefer wearing pants and a long overcoat rather than a burka, abaya or hijab. In the past, Hamas has banned women from riding on the backs of motorbikes, from smoking water pipes, and men from working in female hair salons – saying such practices were immodest. Not all bans, however, have been imposed uniformly. “Hamas has also banned mixed parties and mixed activities as well as enforcing other restrictions on women but not on men. Gaza’s entire seashore has practically been confiscated by Hamas as if it is their private property and they decide who can access the area and when,” Awad tells IPS. The dress code decision has also further undermined the latest unity efforts between Hamas and the Palestinian Authority (PA)-affiliated Fatah movement. PA Minister for Higher Education Ali Jarbawi stresses that Hamas’s decision is illegal and cannot be implemented. He wrote an official letter to Al Aqsa’s president stating the illegality of the move which he said also violated Palestinian government decisions. Dr. Faiq al-Naouk, advisor for managerial affairs at Al-Aqsa University responded saying that the controversial decision would be implemented only gradually as an act of “goodwill” before it becomes mandatory. “Hamas’s increasing radicalisation is one of the sticking points for Fatah and Hamas being able to form a unity government,” says Awad. Hamas has cracked down on other civil liberties too in the past few weeks. ‘New Star’, the annual Palestinian version of ‘American Idol’, was recently banned by the Islamist group on the grounds that it was “indecent” and violated conservative interpretations of Islam. Producer Alaa Al Abed lashed out at the decision, of which he was only informed at the last moment, saying the ban prevented Gaza’s 12 contestants from competing in the second round of the competition. “This is more serious than Hamas just killing fun in Gaza – they are limiting the freedoms of the people, according to their whims,” al-Abed says. Teenage girls and women can only rarely be seen singing in public, but men are encouraged to sing, without musical instruments, about the glory of Islam and fighting Israel. Journalists are also facing censure. Hamas has carried out a wave of arrests of Palestinian journalists in the coastal territory, accusing them of being involved in “suspicious activities”. Palestinian human rights groups say internal security services in the Gaza Strip have stepped up harassment of journalists in the Gaza Strip. The Palestinian Centre for Human Rights (PCHR) distributed a list of media workers it said had been arrested, and condemned the seemingly coordinated campaign, which Hamas officials deny. The ministry added that “those persons are not journalists at all. Even those who work as journalists use this field as a cover to carry out suspicious acts.” The Palestinian media freedoms watchdog Mada issued a statement claiming abuse of those detained as well as confiscation of property and searches. Gaza’s Al Mezan Centre for Human Rights has expressed concern over the repeated use of lethal and excessive force by Hamas police following the death of several individuals during attempts to arrest them. The organisation called on the Hamas authorities to use reasonable force to arrest people suspected of breaking the law, and further called for investigation into the conduct of the police officers involved. Nothing but absolute evil comes from religion and those that impliment it. The Bible, Qu’ran and Torah are the most hateful works of fiction ever foisted on humanity. The people of Gaza appear to have been better off under Israeli rule. Ironic isn’t it? You think Gaza isn’t under Israeli rule? Oh geez. Too embarrassed to put your name to the rubbish you write? If Gaza was under Israeli rule, the terrorists wouldn’t be firing rockets at Israeli towns and the Arab residents would have more freedom, not Sharia law. What a miserable existence -for women -living under islam ,I- as a female living in a free society have -violent thoughts as to what I would do if I lived as these poor degraded women do,to deny them an education -to peer at the world through a black shroud -become an entity -a black ghost -we are all born free -a human an individual -to do and become -whatever we want ,but this is denied to these women -but-they are the only ones that can bring about change -and I can’t see that ever happening.